Wick Mill Pictures, P.O. Box 411; Oswego, Oregon [letterhead]. 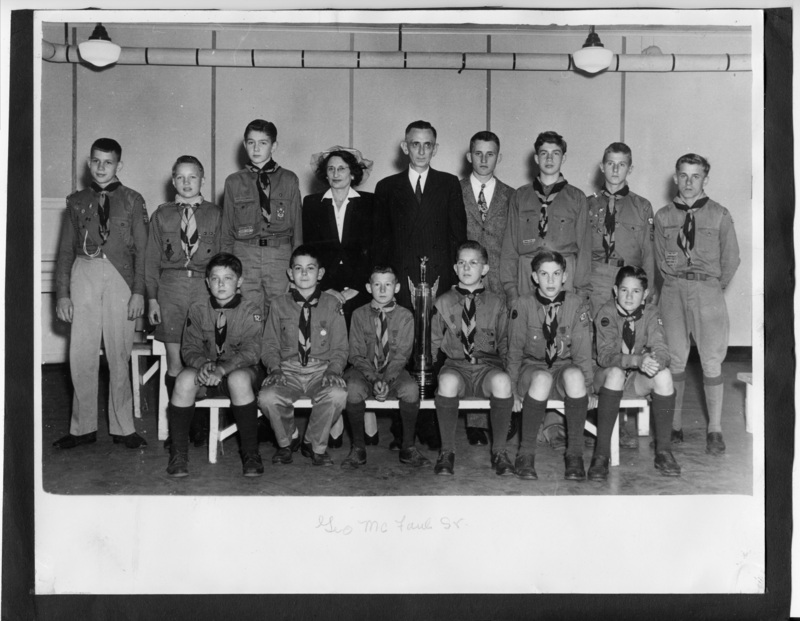 About 1941; Winners of the Portland Area Boy Scout Council Swimming Meet at the Multnomah Club Pool on Sunday May 28 was the district 7 Swimming Team. These boys were honored at a dinner given to them in the Oswego School on Thursday night. In competition with eleven other teams from the the Portland area and representing the picked swimmers from 10,000 scouts, these boys won the Bertram J. Johnson cup for the second consecutive year. Swimming teams from outside the Portland area included teams from Longview, Kelso, Tillamook, and Astoria, Oregon, and from Vancouver, Washington. Back row -- Harmon Marshall; Leon Campbell; Winslow Van Pelt; Millicent Hirshberg, Coach; George McFaul, Scout Commissioner; Bill Kirkpatrick; Bob Brear; Don Pyeatt; Keith Christian. Seated front row - Scotty Beach; George McFaul; Jimmy Listenberger; Tom Crosley; Jack Schiffer; Ted Antonsen. Description Mounted on black construction paper; paper with notes glued to back. Written in pencil on front: Geo McFaul Sr. Transcription Wick Mill Pictures, P.O. Box 411; Oswego, Oregon [letterhead]. About 1941; Winners of the Portland Area Boy Scout Council Swimming Meet at the Multnomah Club Pool on Sunday May 28 was the district 7 Swimming Team. These boys were honored at a dinner given to them in the Oswego School on Thursday night. In competition with eleven other teams from the the Portland area and representing the picked swimmers from 10,000 scouts, these boys won the Bertram J. Johnson cup for the second consecutive year. Swimming teams from outside the Portland area included teams from Longview, Kelso, Tillamook, and Astoria, Oregon, and from Vancouver, Washington. Back row -- Harmon Marshall; Leon Campbell; Winslow Van Pelt; Millicent Hirshberg, Coach; George McFaul, Scout Commissioner; Bill Kirkpatrick; Bob Brear; Don Pyeatt; Keith Christian. Seated front row - Scotty Beach; George McFaul; Jimmy Listenberger; Tom Crosley; Jack Schiffer; Ted Antonsen. Physical Description H 8 1/2" x L 10 1/2"